Anticipation is what drives every one of us in the event industry. At The Idea Hunter, my corporate entertainment agency, we do our best work when we anticipate the future and craft ideas before our clients are aware they need it. Our work needs to inspire, resonate and, most importantly, add real value to our clients’ businesses. When we’re successful, it’s fulfilling not only for my clients and the talent I connect them with, but for me, too. To get to that point, we abide by four key pillars. Call them our creative toolbox. Context: A strong creative idea is more powerful if it connects meaningfully with what is actually happening in people’s lives. Break a Rule: Break the conventions and industries in which you compete to stand a better chance of getting noticed. Art Factor: Elevate your ideas through the highest level of craft and design for the purpose of commercial clarity, but also to go as far as commenting on society and the human condition. Culture Shaping: The best creative ideas get co-opted by media and culture. When audiences adopt an idea and make it their own, we say this idea is culture shaping. In 2003, I transitioned into events and entertainment after running a successful business in the fashion industry. I didn’t know the first thing about entertainment, but I quickly learned by watching others, reading, researching and thinking outside the proverbial box, and while I lacked industry experience, I had vision for the future. I started with entertaining younger crowds at social events, but soon took on corporate gigs catering to broader demographics. I realized early on that the business of entertainment production and finding new ideas was no different than buying trendy accessories for fashion retailers across Canada. After all, in fashion, there’s an expectation that when you present the buyers with new merchandise each season, it has to sell for them to come back again for more. The same expectation prevails in the event industry — what I present to my client has to impress if I want them to stay my client. Social clients became corporate clients as I built relationships, joined associations and began to apply my experience in fashion using the same formula I had been successful with the first time around. I made a decision early on to promote Canadian talent and mentor rising talent so that they could be taught how to engage, perform and understand the business side of entertainment. I was fortunate enough to earn the respect of my peers as I built my reputation, and it was those same people that enabled me to get better at creating my own exclusive acts and disrupting industry norms. Agents helped book gigs, but I wanted to help develop talent and make a difference at the outset of their careers. It’s incredibly rewarding for both them and me. My company just introduced a show called 416Bots, a Toronto-based group. I had seen a similar show on America’s Got Talent and was immediately fascinated. It was a fast-paced, electrifying LED show choreographed to music and lighting with explosive affects that left me in awe of what I had just seen. I found out that it’s expensive to produce, but recently, Maple Leaf Sports and Entertainment approached me about this kind of act, and it was that moment that we decided to invest in it, partnering with a choreographer and friend from the entertainment industry. We did our due diligence, but were tested by a number of curve balls. 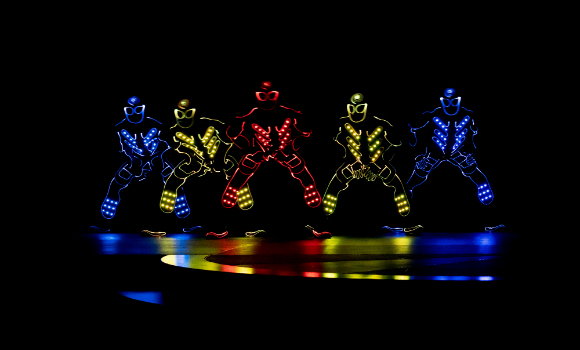 The suits came in the wrong sizes, LEDs came unfit for performance, software was sent late — anything that could go wrong, did. We had only a few weeks before our first show and more problems than successes, but we relied on our network, who from the day one has been there to help me with anything. We found lighting engineers who re-fit the suits, a tailor who alter the suits and, looking inward, the patience to get over each hurdle that we had to. On the day before the show, all we wanted was for everything to work in sync, and thankfully it did. MLSE was happy and, despite our exhaustion, we were thrilled with the outcome. Developing the 416Bots helped further drive our niche in the events space, and satisfied all of the stakeholders, including me. I need to be on the edge of every trend and take risks to win. I have always had a passion for good ideas, and sadly, not every idea I see is good. Discerning between the two often makes me feel like a judge on a talent show, but my clients expect me to rapidly introduce them to new ideas. I need to approach it with my eye toward the future and to the young, local talent I want to cultivate. Without vision you can’t create what matters. Luckily, our success has begotten success. Engaging talent has become easy because we have become known in the urban entertainment market as mentors and the home to rising talent. We’ve helped a new generation of talent rise up and intend to help them on to the next stage of their careers — it’s what makes me proud as a businesswoman and entrepreneur. I began my business in the basement of my house, and I stayed there for many years. But creating what mattered is what I cared about then, and now, in an office I now share with six other fabulous women, it’s what we care about now. This entry was posted in Event Operations, Speakers & Entertainment, Uncategorized and tagged 416Bots, entertainment, Idea Hunter, talent, talent development.